Brandon Overton shows off the first WoO paycheck of 2019. What won the race: Charging to the front of the field at the drop of the green flag, outside polesitter Brandon Overton of Evans, Ga., led all 50 laps, holding off a charging Chris Madden of Gray Court, S.C., in the final circuits to score a $10,000 World of Outlaws Morton Buildings Late Model Series victory in Screven Motor Speedway's Winter Freeze IX. On the move: Cade Dillard of Robeline, La., started 26th and finished 14th. Winner's sponsors: Overton's Rum Runner Racing Rocket Chassis is sponsored by Broward Armature & Generator, CIV Driver Optimization, Molecule, Race-Fan, Simpson Products, Darrell Gwynn Foundation, Burning Bright Band, Dean Guitars, Shell Shock and Tempest Cycles. Points chase: The World of Outlaws 2019 points chase kicked off at Screven. Mike Marlar of Winfield, Tenn., is the reigning series champion. SYLVANIA, Ga. (Feb. 8) — It doesn’t matter the car he’s racing or what number is on the side — Brandon Overton is fast at Screven Motor Speedway. Leading flag-to-flag in Friday’s World of Outlaws Morton Buildings Late Model Series season-opener, the Evans, Ga., notched his third victory in as many starts at the Sylvania, Ga., oval, all coming behind the wheel of a different race car. Winning his heat race and redrawing to start outside the front row, Overton charged to the front of the field at the drop of the green flag, dominating early as he worked his way through lapped traffic. Fifth-starting Brian Shirley of Chatham, Ill., had closed the gap between himself and the race leader when a yellow flag waved on lap 34, slowing the field to give Overton the advantage out front. Overton maintained a comfortable lead when the race went back green, with Shirley losing position to a charging Chris Madden of Gray Court, S.C., on lap 39. Reeling in the race leader, second-running Madden was nose-to-tail with Overton’s back bumper with just a few laps remaining in the 50-lap distance. But he was never able to make a serious challenge for the lead, settling for second as Overton collected a $10,000 payday in the Winter Freeze IX opener. “I was kind of panicking,” Overton said of lapped traffic. “I could see (crewman) (Grant) Pearl down there in (turn) one until we went green. And when we started going green, I couldn’t see him anymore. So I was trying to just to pass them. I was thinking I was keeping one between me, but I guess I wasn’t. A lot of these races now, everybody’s so good. You just kind of have to put yourself in position, set yourself up to be in position right there at the end and just hope the cards fall right for you/"
Shirley finished third, with Darrell Lanigan of Union, Ky., running fourth in his first start at Screven since 2015. After falling back early, Chase Junghans of Manhattan, Kan., regained positions from Brandon Sheppard of New Berlin, Ill., and Ricky Weiss of Headingley, Manitoba, to round out the top five. Starting fourth, Madden nearly climbed the turn-four wall on the opening lap, falling back among the top-10 in the early running. But the South Carolina driver was able to work his way back through the front of the field to post a runner-up finish in his debut with the Greg Bruening-owned, Capital Race Cars-backed team. “It was a great rally,” Madden said. “We had an extremely good race car early tonight and redrew a four. I got hung out on that start and drove in to (turns) three and four a little hot and a little high. My tires were kind of sealed up when I got down there. I guess it was kind of slimy down the back straightaway and I just went into a slide there and got up into the fence and on top of it. After an up and down start to his Georgia-Florida Speedweeks campaign that included a wild rollover at Golden Isles Speedway near Brunswick, Ga., and a pair of top-10 finishes at East Bay Raceway Park in Gibsonton, Fla., Shirley finally found himself on the podium on Friday night. Notes: Overton’s last three Screven victories have not only come in three different cars, but on different tours. He scored a Southern All Stars victory at Screven back in September, following it up with an Ultimate Southeast Series triumph in November… The race was slowed by seven cautions. …. A yellow flag waved on the first lap when G.R. Smith spun in turns one and two. … The second caution fell on lap two for a tangle in turns one and two involving Scott James, Boom Briggs and Ross Robinson. James’s No. 83 machine came to rest atop Briggs’s car. … A yellow flag flew on lap four when Mike Marlar nearly spun in turn four, collecting Ivedent Lloyd Jr. and Jason Covert. Marlar retired. … Smith spun on the frontstretch to draw a caution on lap eight. … A yellow flag waved on lap 34 when Covert stopped on the backstretch; Steve Casebolt spun in turn two to draw another caution on the ensuing restart. Another yellow flew on the second restart attempt when Brian Connor spun. Row 11: Ross Robinson, Dennis Erb Jr.
Polesitter Kyle Hardy shot to an early lead, with third-starting Tyler Bruening in tow. Hardy stretched his lead over the field at the halfway mark, as Michael Norris began closing the gap between himself and second-running Bruening. Holding nearly a full straightaway lead, Hardy won the consolation, with Bruening finishing second. Dennis Erb Jr. overtook Norris on the final lap to take the third and final transfer spot. Finish (top three transfer): Kyle Hardy, Tyler Bruening, Dennis Erb Jr., Michael Norris, Boom Briggs, Matt Sponaugle, Cade Dillard, Michael Brown, Chuck Hummer. Scratched: Cla Knight, D.J. Troutman. Polesitter Steve Casebolt charged to the lead at the dropped of the green flag, as John Henderson attempted to reel in second-running Ross Robinson in the early laps. It was fourth-starting Scott James rolling through the field, advancing up to fifth at the halfway mark. A yellow flag waved on lap nine when Frank Heckenast Jr. slowed on the frontstretch. Never challenged up front, Casebolt won the consolation, with James overtaking Robinson on the restart to finish second. Finish (top three transfer): Steve Casebolt, Scott James, Ross Robinson, Ryan Scott, Ray Cook, Blake Spencer, Jadon Frame, Stacy Boles, Joe Denby, John Henderson Jr., Frank Heckenast Jr. Scratched: Brent Larson. Row 2: John Henderson Jr., Frank Heckenast Jr. Charging ahead out of turns one and two, outside polesitter Darrell Lanigan took an early lead, as Shane Clanton and Jason Covert battled door-to-door for second. With Clanton on the rear bumper of Lanigan, Boom Briggs began reeling in third-running Covert just shy of halfway. A yellow flag waved on the fifth lap when D.J. Troutman slowed after getting into the wall. Another caution fell on lap six when Matt Sponaugle spun exiting turn two. Covert slid ahead of Clanton in turns three and four to take second on the restart, with Lanigan continuing to show the way out front. Cla Knight slowed on the backstretch to draw a caution on lap eight, with another yellow waving on the ensuing restart when Briggs spun in turn four. Lanigan led the final laps to win the heat, with Covert finishing second. Clanton finished third, with Brian Connor edging Michael Norris to take the fourth and final transfer spot. Finish (top four transfer): Darrell Lanigan, Jason Covert, Shane Clanton, Brian Connor, Michael Norris, Boom Briggs, Matt Sponaugle, Cla Knight, D.J. Troutman. Rolling around the outside, second-starting Chase Junghans led the opening lap, as Kyle Hardy and Brent Dixon raced side-by-side for the final transfer spot. A yellow flag waved on the second circuit when Michael Brown spun in the bottom of turn two. Junghans maintained his lead on the restart, with Brian Shirley overtaking polesitter Brandon Sheppard for second on lap three. Holding a comfortable lead at the checkered flag, Junghans won the heat, with Shirley finishing second. Sheppard rounded out the podium in third. Finish (top four transfer): Chase Junghans, Brian Shirley, Brandon Sheppard, Brent Dixon, Kyle Hardy, Tyler Bruening, Dennis Erb Jr., Cade Dillard, Michael Brown, Chuck Hummer. Shooting ahead of fellow front-row starter Chub Frank out of turns one and two, polesitter Brandon Overton took an early lead, with cars racing three-wide for fifth on the opening lap. A yellow flag waved on the third circuit when Brent Larson stopped in turn four after losing a right-rear tire. Overton held his lead as the race went back green, with Billy Moyer sliding ahead of Frank out of turns three and four to take second on the fourth circuit. Another caution fell on lap seven when Joe Denby slowed on the backstretch. Never seriously challenged for the lead, Overton wont the heat, with Moyer finishing second. Frank regained the third spot from Ivedent Lloyd Jr. in the final laps. Finish (top four transfer): Brandon Overton, Billy Moyer, Chub Frank, Ivedent Lloyd Jr., Ross Robinson, Frank Heckenast Jr., Stacy Boles, Ryan Scott, Joe Denby, Brent Larson. Polesitter Chris Madden shot to an early lead, with fellow front-row starter G.R. Smith falling back to fourth on the first lap. As Mike Marlar began challenging third-starting Ricky Weiss for second on lap three, Madden stretched his lead over the field. Slipping past Weiss, Marlar took the second-place spot at the halfway mark, with Smith regaining fourth from Steve Casebolt. Setting a torrid pace out front, Madden won the heat, with Marlar and Weiss rounding out the podium. Finish (top four transfer): Chris Madden, Mike Marlar, Ricky Weiss, G.R. Smith, Steve Casebolt, John Henderson, Ray Cook, Blake Spencer, Scott James, Jadon Frame. Row 2: Billy Moyer, Frank Heckenast Jr.
Row 4: Tyler Bruening, Dennis Erb Jr. There were 31 cars on hand for Thursday’s practice session, with Rocket Chassis house car driver Brandon Sheppard of New Berlin, Ill., clocking the quickest lap of the night. While winless so far in 2019, Sheppard has posted 11 top-five finishes in his first 11 starts of the season. He enters the Screven weekend after finishing fifth on Wednesday at East Bay Raceway Park in Gibsonton, Fla. … Notably absent from the Screven pit area is Rick Eckert of York, Pa. Unable to put together a program that would allow him to race full-time on a national level in 2019, Eckert is forgoing Georgia-Florida Speedweeks, missing his first World of Outlaws event since the tour’s reincarnation in 2004. Eckert captured series victories at Screven in 2016 and 2017. … After spending the last three seasons on the Lucas Oil Series, Darrell Lanigan of UnIon, Ky., returns to Screven for the first time since 2015. The three-time World of Outlaws champion picked up a tour victory at the Sylvania, Ga., oval back in 2012. … While Lanigan is returning to his self-owned equipment, Chris Madden of Gray Court, S.C., is set to make his debut with the Greg Bruening-owned and Capital Race Cars-backed team. Reigning World of Outlaws champion Mike Marlar of Winfield, Tenn., will also make his first start behind the wheel of the K&L Rumley Enterprises No. 6. 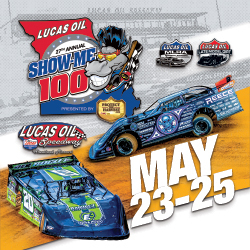 … Kicking off another season with Dolhun Motorsports, Scott James of Bright, Ind., has thrown his name into the ring of drivers chasing the World of Outlaws title in 2019. James last followed a national tour in 2007, where he finished runner-up to Earl Pearson Jr. of Jacksonville, Fla., in the Lucas Oil Series standings. … World of Outlaws Rookie of the Year contenders Ricky Weiss of Headingley, Manitoba, and Cade Dillard of Robeline, La., return to action after scoring victories in January’s Keyser Manufacturing Wild West Shootout at Arizona Speedway near Phoenix. Weiss captured a pair of Arizona victories, including the $14,000 WWS finale, while Dillard’s Jan. 12 victory marked the biggest of his relatively limited Late Model career. … Assisting Dillard this weekend is former Dirt Track World Championship winner and chassis builder Jimmy Mars of Menomonie, Wis. … While he plans another chase of the DIRTcar Summernationals in 2019, former WoO contender Frank Heckenast Jr. of Frankfort, Ill., has joined series competitors at Screven. He’s also scheduled to enter upcoming Speedweeks events at Bubba Raceway Park in Ocala, Fla., and Volusia Speedway Park in Barberville, Fla. … Recently announcing he would be following the WoO tour again in 2019, Brent Larson’s car has a new paint scheme featuring the Lake Elmo, Minn., driver’s new major sponsor Drydene Oil. … After racing at East Bay on Thursday night, Brandon Overton of Evans, Ga., and Brian Shirley of Chatham, Ill., are among drivers that have joined the field at Screven. Friday’s portion of Screven Motor Speedway’s Winter Freeze IX kicks off the 2019 season for the World of Outlaws Mortan Buildings Late Model Series. The national tour returns to the Sylvania, Ga., oval after last year’s Georgia-Florida Speedweeks events were rained out. Rick Eckert of York, Pa., and Chris Madden of Gray Court, S.C., were the winners of the 2017 Winter Freeze events at Screven. Eckert is forgoing a trip to Speedweeks this year, while Madden is set to begin his third chase of the World of Outlaws title. Friday’s WoO program will include hot laps, time trials, heat races, consolations and the 50-lap, $10,000-to-win main event. Saturday’s show will feature the same program. Crate Late Models are among other divisions that will be in action. Watch live video coverage of the weekend doubleheader at DirtonDirt.com.